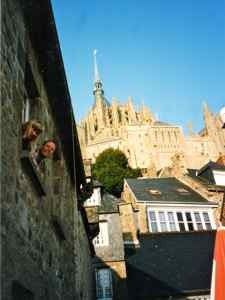 "Friends have told me we should see Mont Saint Michel. ...and we didn't when we first went. Expect it to be crowded. It probably is always crowded. It probably always has been crowded. But it's worth dealing with the crowds. ...the church spires reaching toward heaven (that was sort of the point!). It has attracted pilgrims for hundreds of years. Today it attracts more visitors than ever... mostly tourists... but that's what we are... tourists and travelers. We encourage you to visit. Cars will no longer be in the picture! The island sits on the north coast of France... on the river that defines the border between Normandy and Brittany. 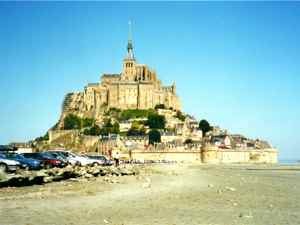 It has changed course through the years... at one time, Mont Saint Michel was in Brittany, now it is just inside Normandy. 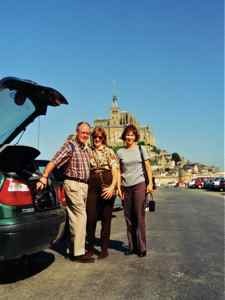 Plenty of tours include Mont Saint Michel in their itineraries, but it's easy to do on your own. It's certainly attracted us a couple of times. You can even get day tours from Paris but it would be a long day... it's a little over 200 miles. Most sites we've looked at say it takes about 3-4 hours to get there from Paris. It would be better to include it in a tour of Normandy. The way we did it was to include it in driving trips to Normandy and Brittany. The legend is that a bishop in the 8th century heard the voice of the Archangel Michael telling him to build the Abbey. 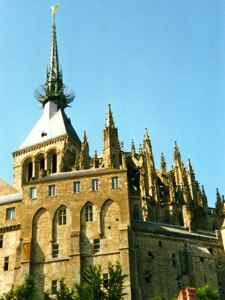 There had been churches on the site before, but the striking Abbey of Mont Saint Michel was what started drawing pilgrims. The land around the island is a flood plain, and it is often surrounded by water at high tide. There was a causeway that led to the island, but that was demolished in 2014. It is no longer as isolated as it once was because the causeway had stopped the flow of tides around the island and much of the bay silted up... but that is changing. See our note at the bottom about that. The Abbey church is only the top most building on this little island. It is surrounded high on the hill by monastic buildings. The granite rock it sits on is 275 feet (84 meters) high. Mont Saint Michel is pure granite, so it has resisted time and the tides... holding steady as... well steady as a rock. ...but inside the Abbbey itself, it is very simplistic, almost stark. The rest of the island has been developed through the centuries with a warren of small houses and shops on its lower levels. The village that grew up around the abbey lies crowded within fortifications of crenelated ramparts and towers. The lower parts of Mont Saint Michel were built as a medieval castle for defense. Once you enter the gate, the main road winds up the hill through what has become a gauntlet of tourist shops. 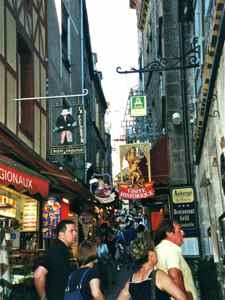 Pilgrims had to eat too, so there have always been food stalls and inns. It's probably been chaotic on these lower levels for centuries. You can still find religious souvenirs among the t-shirts and keychains. There are still pilgrims to the site, but most visitors are tourists like you and me who just want to see the Abbey. Just don't let this gauntlet stop you. Once you get through all of this and up to the Abbey, you'll find it is worth it. There is only one main street winds up to the church, but we had fun exploring little side alleys and walkways overlooking the tidal areas. Allow enough time to explore it all. The town is like a maze with staircases going up behind the shops. Walkways snake around and lead to surprising vistas looking over the bay. We spent the night on the island, and we recommend you do too. The crowds will go home, and you'll have a different perspective to remember it by. 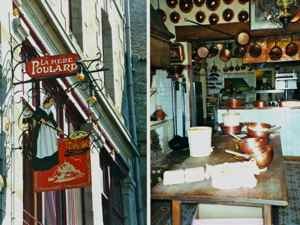 La Mere Poulard is the one we had heard about before we went. At the entrance to the restaurant, waiters beat eggs for omelets with a catchy cadence that attracts hungry tourists. The omelets are cooked over fires. The menu is pricey, but you can watch for free. We first saw it on a TV travel show, and we got it in our heads that we HAD to eat there.... just like the many celebrities whose photos line the restaurant's rooms. If you feel like a splurge, go ahead and have an omelet and cider. If you'd rather... there are also plenty of sea food restaurants with views of the bay. Actually, finding one of those for yourself is what we'd recommend. An overnight in one of the many hotels and B&Bs will give you the time you need to wander to all the lookouts and back alleys. You'll almost feel you have the island to yourself. We used to say... Whether you drive in for the day or to spend the night, park in the pay lot near the entrance. Be forewarned, it's not worth trying save money and park off on the lower edges. Now there is NO causeway! In 2014 they began dismantling the causeway and building a pedestrian brigdge. You will be parking on the continent so to speak. We haven't done that, so we can't tell you details, but it will be better. This new approach should allow circulating tides to make Mont Saint-Michel an island again, and that would be wonderful. 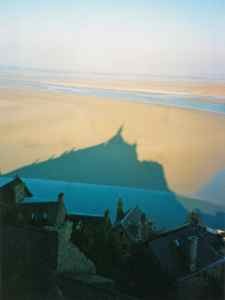 I think part of the draw is just that Mont Saint-Michel is such a beautiful sight as it seems to float on the horizon.